When people matter, they have agency and power, their rights and protections increase. People matter to the powers that be when, if they do something other than what the powers that be want (e.g. government and corporations), the powers that be suffer. Whether people matter has never been principally a story of morality or will. Whether people matter is a story of context. The value of the average American worker can be seen in the rise and fall of unions. In the past 40 years, membership in unions has declined precipitously in the U.S. In 1979, 34% of U.S. male private-sector workers and 38% of men without a college degree were members of a union. Today, less than 7% of the same population are union members. 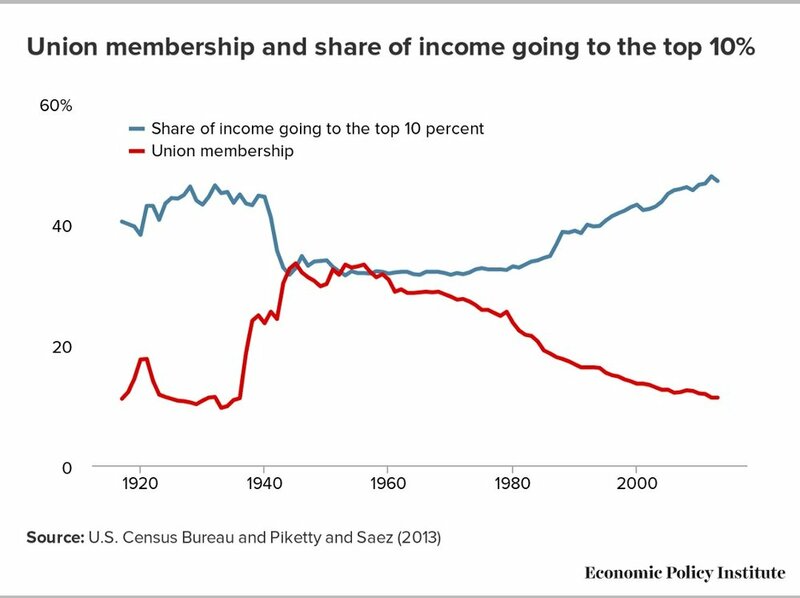 The decline in union membership has coincided with a stagnation in wages. Today’s average hourly wage has the same purchasing power it did in 1979. This decline also correlates with a rise in wages going to the top 10% [see figure left]. Recent studies suggest that American workers’ wages would be 5% higher for nonunion private-sector male workers and 9% higher for nonunion males without a high school degree if the proportion of union workers had remained unchanged. If workers benefited from union membership, what brought about the demise of the unions? To understand why unions fell, we need to understand the history of their rise. The growth of unions in the U.S. began in the late-19th century in large part in response to the Industrial Revolution. The Industrial rRvolution led to a growth in urbanization, increasing specialization, and increased competition among workers. In rapidly urbanizing cities, workers did not matter much because they were replaceable. If a small number of workers took a stand for fairness and better working conditions by calling a strike, they didn’t hurt their employer. They simply were fired and immediately replaced. In theory, however, the Industrial Revolution’s specialized labor forces had significant power. This was because, in mass, they were irreplaceable. Collectively they could exert power. Organizing was tough and unless all the workers joined together, they were better off acting individually. We can model the situations the workers faced using game theory. The models that follow involve two actors, each with two possible actions, and each affected by the action of the other. The boxes on the bottom right where their respective actions converge are the outcomes, with the outcome for the actor on the left side being described first. The blue box demonstrates the actions the workers take in each phase. As we can see, both workers are best off working in concert, whether that is demanding better working conditions or continuing to work. If both workers choose the same action, the result is a Nash Equilibrium. Nash Equilibria are stable decision states in which neither actor can improve their position by acting unilaterally. That is, if one worker knows what action the other worker will take, it is always best for that worker to mirror the action of the other. Since workers A and B both begin as workers, their best course of action outside of coordinated action, is to change nothing. If they unilaterally choose to demand better working conditions, they face the worst possible outcome. If, however, both workers were to demand better work conditions, they would achieve the ideal outcome. Still, the rational course of action for the individual worker was to choose to work. Since working was the best decision for each individual worker, workers generally had very limited negotiation power and were subject to abuse. While rational for the individual, the decision to work instead of demand better conditions was, of course, unnecessary. The workers had power because together they were irreplaceable. By getting all the plumbers, auto workers, or construction crews to choose to act collectively, unions could create an incentive for cooperation and enable the development of systems that were advantageous to workers. Aligning the majority of workers was not easy. As a result, unions were challenging and imperfect. Yet as long as each worker had reason to believe the others would demand better working conditions, the logical course of action was for every worker to demand better conditions as well. When companies began losing power to unionized workers, they pushed back by engaging the government in their efforts to prohibit workers from unionizing. Unfortunately for the companies, unionized workers had become a politically effective group. In 1935, FDR’s New Deal democrats passed the National Labor Relations Act. The new law explicitly protected unions’ rights to organize. Within 10 years, there was a 300% increase in union membership in the U.S. Yet while organizing and laws like the NLRA were helpful, the single most important factor in the rise of unions was that people mattered. As a group, specialized workers had become irreplaceable. Unions served as the organized platform that helped workers realize their collective power. The number of private sector union members grew until 1979, when the decline of unions began as rapidly as it had risen. This decline was driven by a change in the workers’ context brought about by globalization. Globalization, like the industrial revolution, changed the context for workers and companies, pitting workers and companies against new groups of workers and companies. In the 1970s, imports from countries like Germany and Japan began to threaten the competitiveness of American products. This forced American businesses to seek ways to produce more for less. This dynamic is modeled below, with a U.S. based company and an international company that pays their workers less. As businesses were forced to compete with cheaper goods, their workers were forced to compete with cheaper labor overseas. The unionized American workers faced a new context, this time with no advantage from cooperating amongst themselves as American workers. In this world, American workers demanding better work conditions lose their effectiveness. Perhaps the most potent expression of the power of unions was the labor strike, which enabled unions to halt production. This tactic became far less effective when the American economy globalized. Between 1970 and 2010 there was a 97% decline in large-scale strikes by unions. The decline in union potency over these four decades also can be seen in the deregulation (despite union objections) of numerous industries, including airlines, trucking, railroads and telephones, and the passing of laws reducing the effectiveness of unions. Where private-sector unions remain, they are most likely to represent occupations that cannot be outsourced. The largest predominantly private-sector unions today are the Teamsters and the Service Employees International Union. These unions represent tankhaul drivers, healthcare workers, janitors, bus drivers, and construction workers, among others. As private-sector unions have declined, public sector unions, representing educators and other government workers, have experienced significant growth since their jobs cannot be outsourced. Globalization may have made the average American worker matter less, but it has not led to stagnation for the American economy at large. While private-sector union membership declined and wages for the typical American worker stagnated over the past several decades, the U.S. economy has continued to grow, as has workforce productivity. At the same time, globalization has led to improved working conditions and living standards for the global worker, although they too face the same dynamics as the American worker. With globalization, the context changed for American workers but the dynamics were nothing new. Globally, people still mattered to production but collectively the American worker and the union member didn’t matter much more than the individual. In this sense, today’s reality is similar to when American unions took off 100 years ago, except global workers now fill the role of American workers. A global union could fill the same role of American unions, but this reality presents massive challenges to organized labor. It is overly simplistic to suggest that globalization alone is to blame for the decline of American private-sector unions or for the stagnation of American wages. The examples used here offer at best a partial explanation. Among other factors, technological advances and changes in law have played significant roles. What remains consistent among all of these causes is that when people did not matter, their rights and basic living conditions did not improve. The union example shows us that the protections a worker desires were not granted because of morality or their will — those were largely unchanged for the American worker — but because for a period of time the American workers came to matter more to those who were making decisions. When technology automates production, it changes the context within which workers find themselves. To illustrate this, let’s examine a subset of the American workforce which maintains a strong union: truck drivers. While not at jeopardy of losing their jobs to outsourcing, the unionized truck driver means substantially less to the trucking company if trucks drive themselves autonomously. When workers were members of unions and voted more consistently as a union block, politicians were more likely to serve union interests. As with companies, governments make decisions that satisfy people who matter. In this sense, the rise and fall of the American union and the experience of the American worker can teach us an important lesson: if we want people to enjoy better rights or improved treatment, we cannot just demand or believe that it should be the case. We need to ensure that people matter. For when people don’t matter, people are treated like they don’t matter.